I just returned from a workshop called “Cool of the Day” in Elkins, West Virginia. 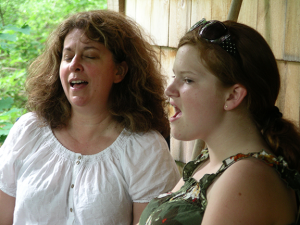 I traveled with several members of Emmanuel’s choir to the Allegheny Highlands to learn and sing and play some of the legendary ballads of the West Virginia forests. We visited many sacred spaces and sang our songs there. We did a lot of unaccompanied singing celebrating the beauty of the human voice the original stringed instrument! We played a little guitar and listened to some fine banjo picking, fiddling and even a little clogging. The leaders of the workshop were Michael and Carrie Kline, who have devoted themselves to documenting and performing ethnic stories and music of rural and small town America. At home in West Virginia, they feature Appalachian ballads, the impact of coal mining and oral history. We so enjoyed the cool of the mountains, the gentle rains, the green forests and plentiful gardens. I was glad to have the time to visit and celebrate the beauty and peace of sacred spaces in song and story. As I drive through the countryside with new eyes this time – maybe not just rushing from one place to another, but thinking of the history here and the many stories and songs and faithful lives that have gone before, I think of this garden of ours. “Now is the Cool of the Day” was written by Kentucky singer and folk songwriter, Jean Ritchie in the early 1970s. It draws its inspiration from Genesis 3:8… “Then the man and the woman heard the sound of the Lord God as he was walking in the garden in the cool of the day…” Ritchie expands the thought to imagine God returning to his garden now to see how we have been keeping it. God comes back to his garden in the cool of the day – a thoughtful and reflective time of day. We are called to love God and to care for each other and for our garden, the earth. “In the summer of 2007 I had the great pleasure of hosting Michael and Carrie Kline for a performance at the Smith Creek Playhouse in Franklin, WV. . . . The Klines had been on my radar for some time before I decided to bring them to the playhouse as I had heard them play in live performances, radio shows and recordings. . . .
“Audience members were treated to a repertoire of traditional songs from West Virginia as well as more contemporary pieces. These focused mainly on the rural landscapes and communities from which they originated, and often emphasized the struggle between local cultures and modern outside interests that sometimes threatened their ways of life. They shared excerpts from their oral-history-based audio driving tour of Pendleton County, which won the Spirit of West Virginia Award from the WV Division of Tourism.